When I last left you, Hacivad Bey was, as usual, quoting Rumi about “strange journeys,” and it indeed had been one, as I awoke to Provincetown bathed in pink light after dreaming about spinning like a Sufi at worship. But here I am, pressing the well-known code to our garage, the frustratingly gummy buttons blinking a light green upon every extra-hard touch – and no door opening commences. Falling quickly out of my sleepy, pensive and dreamy state, I hit the garage door code box a few times for good measure, to no avail. Leaving the puppets in the car (although he is not able to see them), M. joins me in a totally fruitless effort to open the garage, so we can park the car and unload. “What kind of gecekondu is this, after all?” Karagöz hollers from the car. “You can’t get the door open? 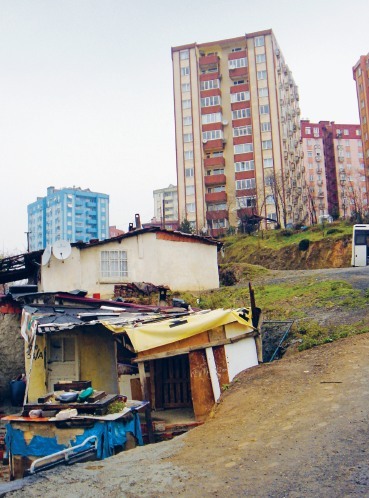 What a mess.” Karagöz is, of course, referring to the structures built overnight in the wasteland areas of western Turkish cities by people emigrating from Eastern Turkey. The general idea is, if you build it over night (gece), it is then yours. M. tells me that in a somewhat misguided public health policy effort, local belediye (government authorities at the local level) will install sewer and electrical services in order to stem the flow of ill health and disease. This has resulted in great swaths of gecekondu around the outskirts of many cities – all built to nothing close to the legal code. And here we are in Provincetown, and Karagöz is saying we live in a gecekondu. Well, to be honest, I am frustrated as well. I am tired, we want to park the car, the dog needs to pee – we need to lug our stuff up the stairs. It would be nice if the garage door worked, but it does not. We find a space for the car – unheard of in summer – possible in winter. We commence the lugging…the humans, the puppets alike. As we trudge up the steps to the second floor entrance, I hear the complaints beginning. “Look at the state of this patio. Shameful, m’lady, no plantings! And the state of those unruly bricks?” Kenne is demanding in her tone. A lady, apparently, should not let her patio go. “Yes, I know, Kenne, we are leaving it like that until after the construction. It will be a lovely spot then!” My reply is meek. “Look at the state of the windowpanes – sand-etched from the winds off the bay – why not replace the glass?” Zenne touches the glass with her finger, feeling the bumps of it. “Yes, I know, Zenne, I realize, but again, we are getting all new windows next year, so for now, we can live with it, yes?” I am hopeful for a positive nod, but am still feeling meek. Zenne rolls her eyes. “I realize, dear puppets ,that the state of the floor is unacceptable, but my same answer holds – we are knocking all the insides down and starting from scratch.” I am feeling a bit impatient with the puppets, even though I totally agree with them. The truth is, this place is a gecekondu – truly. When we met our neighbor, Eartha, an old French lady artist with lots of opinions -and a long memory – she told us all about how this building came up – an illegally built apartment later granted permission as there was no option given the political connections of the owner. You can see the gecekondu nature of the place everywhere – the kitchen walls are made of plywood, the windows are installed at strange angles, the closets are hastily constructed from pressboard and the bathroom is fit into the smallest space imaginable. Over the years, as it has been bought and sold, it has been brought “up to code,” but it is not a tightly-designed space. We are going to gut the inside and start over – but it takes time. As I explain the plan for the metamorphosis of our very own gecekondu to the puppets, they nod their heads in understanding and decide to take up residence on the lazy Susan (rotating tray) on the middle of the table for the night. I notice that they too are interested in spinning Sufi-style – I did not know that these little puppets – so diverse they are as a bunch – all practice Sufism through spinning. They are spinning – one hand to heaven, one hand to earth – as the lazy Susan is spinning on the table. This is the final image in my line of sight for the night, as I beat a hasty retreat to sleep. This entry was posted in Visits from the Karagöz puppets and tagged gecekondu, housekeeping, Provincetown, roadtrip. Bookmark the permalink.